Save substantial money by outfitting your new machine with a Pre-Owned fiber laser. As many buyers know, the fiber laser component is by far the highest cost part inside a laser machine. And, the major fiber laser manufacturers claim 100,000 hours before a failure. 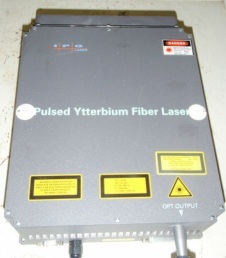 We stock and sell fully warrantied pre-owned fiber lasers that are installed in new laser machinery. Select your new laser marker machine from our Cromwell series of machines. Select your new flatbed machine from our F Series located on the menu on the left. Many companies purchased pre-owned laser sources because the sources st so many years. IPG Photonics, for example, has supplied fiber lasers for the Telecom industry that demands a 25 year life on products. This very long lifetime can be seen in fiber lasers operating in good condition for many years.